Custom DragonBoard 410C AeroCore 2 Expansion Board Designed for MAV and IoT Innovations. REDWOOD CITY, Calif. June 9, 2016 — Gumstix®, Inc. the leader in design-to-order embedded systems, today announced the release of their custom AeroCore 2 expansion board for the DragonBoard 410C priced at $149, this new expansion board provides a versatile platform for designing and building of MAVs and UAVs. Designed in the Geppetto® Design-to-Order (D2O) platform by Gumstix engineers, the AeroCore 2 expansion board for Dragonboard 410C is stacked with features, like a Nimbelink LTE model socket capable of transmitting data to laptop, a 15-pin CSI2 camera connector, eight PWMs, a 16-pin GPIO header, an SPI header, GPS support, a Spektrum DSM-2 remote connector and the powerful ST Micro Cortex-M4 microprocessor supporting NuttX RTOS. The Gumstix AeroCore 2 expansion board for the DragonBoard 410C is a more technologically advanced version of the current AeroCore 2 for Gumstix Overo COMs. It adds the superior connectivity of NimbeLink LTE modems and hardware support for high-quality imaging to the already exceptional AeroCore 2 design. The CSI2 serial camera connector provides the hardware needed to connect HD cameras, such as the Raspberry Pi Camera to this MAV controller. 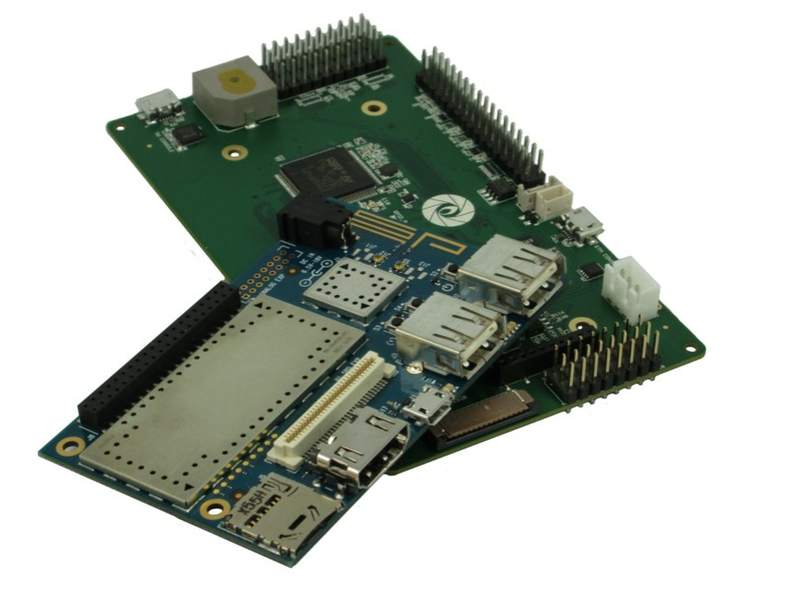 With an integrated Cortex-M4 microprocessor, NuttX RTOS and GPS support, this MAV expansion board is an ideal embedded platform for the Gumstix Pre-Go series of u-blox NEO 7P GPS/GLONASS receivers, purchased separately, like the Gumstix Pre-Go Precise Point Positioning GPS receiver priced at $79. Top and bottom perspectives of the AeroCore 2 expansion board for DragonBoard 410C designed in Geppetto D2O. Arrow Electronics, Inc., a Fortune 500 company founded in 1935, is a global provider of products, services and solutions to industrial and commercial users of embedded computers and enterprise computing solutions. Arrow currently offers the DragonBoard 410C and the AeroCore 2 for DragonBoard 410C. The DragonBoard computer-on-module features a Qualcomm Snapdragon 400 series processor with a Quad-core ARM Cortex A53 (max 1.2 GHz per core) supporting Android and Linux, WiFi/Bluetooth, 1GM LPDDR3 533MHz, 8GB eMMC 4 and a Micro-SD card slot. The DragonBoard 410C also includes the Qualcomm Adreno 306 GPU with support for advanced APIs (including OpenGL ES 3.0, OpenCL and DirectX) and 1080p@30fps HD video playback/capture. The AeroCore 2 for DragonBoard 410C can be purchased directly at gumstix.com or customers can use the Geppetto® D2O online design tools to clone and drop the AeroCore 2 expansion board for the DragonBoard 410C into the Geppetto® D2O workspace to jump start their own custom design. Users can choose from a library of hundreds of different modules in Geppetto® to create their unique AeroCore 2 DragonBoard 410C expansion board.